Ten Dots. Five Colors. Okay Puzzle Game, You've Got Me. Flow is a simple game. But it's one of the most enjoyable games I've played in recent memory. Simple, I think, is good. In Flow, there are ten dots, two of each color (blue, red, yellow, orange, and green). The goal is to connect them so that all of them can be connected in the 25 spaces of play. 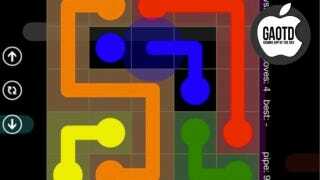 Flow is a puzzle game. It's a simple puzzle game. But like I said, simple is good. And so is Flow. The game has a free to play version, which is the version I checked out out. There are ads, sure; however, you can also shell out for the paid version.